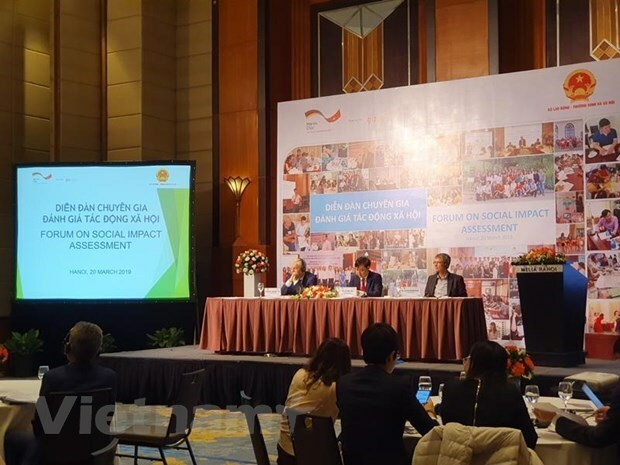 Hanoi (VNA) – The German Development Cooperation Agency (GIZ) and the Ministry of Labour, Invalids and Social Affairs held a forum in Hanoi on March 20 assessing the social impacts of policy loopholes on vulnerable groups. The event aimed to help carry out the social target project on sustainable green growth in Vietnam. Participants said the Vietnamese Party and Government have issued several strategies and policies on green growth, sustainable development and reform of the growth model. In recent years, social indexes have improved considerably, with falling rates of poor households and unemployment in urban areas and an increase in skilled workers and health insurance card holders. However, the rate of poor households in several areas, especially in mountainous areas, remains high, up to nearly 70 percent. Despite progress in multidimensional poverty reduction at the national level, big gaps are still seen in regions and residential groups. The rate of those in need of social support remains high, accounting for 28 percent of the total population, including the elderly, poor children, the disabled, and poor and near-poor households. Tran Van Loi, from the Ministry of Justice’s Department of common issues on legislation, said socio-economic and environment factors still lack links so a part of residential community, especially women and vulnerable groups, have yet to fully enjoy social welfare benefits. GIZ Country Director Jasper Abramoski said the agency will continue assisting Vietnam in sustainable green growth in social inclusiveness, ecological balance, political participation and economic growth.